Available May 1, 2019. This 1-bedroom apartment at St. Andrew's Walk East, in the vibrant Bear Mountain Village boasts multiple amenities just outside your door. Backing onto one of the village's world-class Nicklaus-designed golf courses, there are also walking and hiking trails and a wonderful tennis facility right in the neighbourhood. All the major shops and services of Millstream and Langford are nearby, and downtown Victoria is just a few minutes drive, but this condo is located in the heart of the village, just steps away from restaurants, coffee shops, and the Westin Resort's gym, pool and spa. Stainless steel appliances, granite counter-tops, hardwood floors and a spacious, open-concept layout make for a clean, modern living space. With a fireplace and soaker tub, and views of the village and Mt. 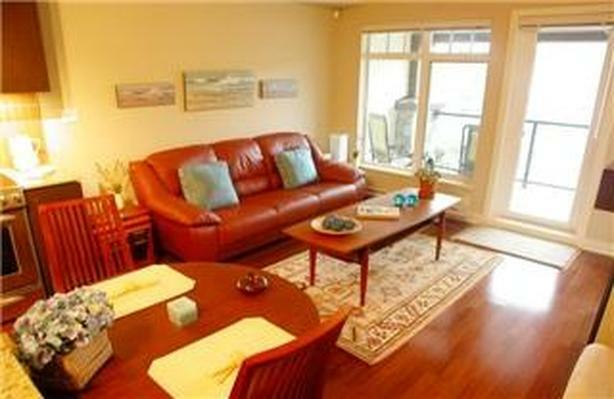 Finlayson from the balcony, this is a cozy apartment in any season! There is secure underground parking, in-suite laundry and a good amount of storage, with lots of natural light! Small dogs will be considered, otherwise no pets, sorry!